Unfortunatly, my predictions of how France would end up came true. 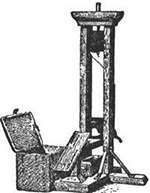 This was caused when the Committee of Public Safety gained alot of power and was being led by Maximilien Robespierre. At first, they helped quite a bit, then they decided to keep the revolution going by starting the Reign of Terror. My life at this time was dangerous and undesirable. People could be executed for the smallest offences or for made-up crimes. Thousands died by the guillotine, by cannon fire and drowning. How did I survive? I rarely went outside when this happening and I never went to executions because I considered it the cause of uncivilazation in France. If any one was sick or came knocking at my door for medical help, I replied to them that I had live specimens of diseases and that I would feel no guilt throwing them outside to make France suffer. I burned all the medicine I had one day in the street to show that I was not willing to heal any of them. During one night when executions were slowing down, I decided that I would escape until things calmed down. France did not really need doctors anyway I thought as I ran out of the borders of the country, I yelled at the top of my lungs when I was on a hill looking down upon France. I yelled "Shame upon all the souls France! You will kill everyone until everyone has lost their head! May all you evil people burn in the flames of revolution!' I moved into a cabin for treating the sick in the mountains of Switzerland for the rest of the Terror. I came back to France horrified at the results of the event.